Sheesh, the Xmas break just flew by. And here I am sitting back at work. Not too many people here with me yet tho. Smart people. Or not, I definitely prefer to save my leave days for other times of the year (speaking of which, The Trucker and I are discussing Vietnam for this year!). Spent Friday night at Dad's, catching up and watching the Russell Peter's Green Card Tour. On Saturday morning I headed to Mom's and entertained Finny&Jax (the kittens - who are too lovely) while she got things ready for our trip to the Beach Cottage. And then it was off down to the sea! The Peeb and Doc were already there and we all stayed till Monday. The weather was pretty awesome and we swam about twice a day (unheard of usually! But the water was wonderful). We stayed overnight and wandered the town in between plenty of reading and, of course, the cryptic crossword - haha. We ate dinner at Ye Olde Tavern, which was delish :) On Wednesday afternoon we headed home and Dad made us crayfish for dinner! Instead, I had coffee with Interviewing For a Husband (delish Pineapple and Ginger Juice at Tasha's - which I normally hate going to). In a bizarre twist of fate, her life is repeating itself yet again - haha. It's actually quite surreal. Just before she has to leave the country for work (supposed to be for 3 years this time! ), she meets a man she actually sees a future with. So, we had lots to catch up on. After Jam cancelled, I called up @jarredcinman to see what he was up to. He was headed to Silvermine for the afternoon. I hadn't been since before I moved to Joburg - The Lying Pilot and I used to go often. So I met up with them there and we even swam in the Dam ... it looked freezing, but it was awesome! So much swimming this year! And then I headed to The Divine Miss M's to see what our back up dinner plan was ... We started at Fat Cactus for margarita's and chili poppers and then headed to Miller's Thumb for dinner & dessert. She had a divine chili chocolate steak. I had an acceptable Tuna. Instead I hung out with Dad for a while and then headed back to the Beach Cottage for the afternoon (was considering one last swim, but the tides were wrong and the wind had come up). Instead I played with the kits and hung out chatting with Mom. We then headed to Satori for dinner. I had some pasta and Mom had a pizza she raved about. And then it was off to The Trucker's house for our New Years Eve braai with his sister, @Toxic_Mouse and @zoosev & her hubby. We had a lovely evening and saw in the New Year quite quietly ... or we would've except for the billion fireworks going off around us! Sheesh. It was madness. Am not a fan. We started with the new Sherlock Holmes. I quite enjoyed it. 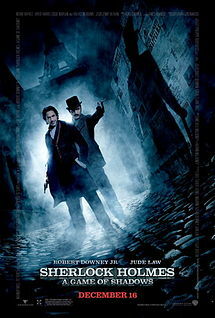 But I still dunno why they bothered with the Sherlock Holmes aspect of it. Not that I know the Sherlock Holmes stories well, but it doesn't feel Sherlock Holmes-y to me. And it's not one of my favourite Robert Downey characters either. But yeah, generally good fun. And then, because there were only about 4 people in the cinema, we followed that up with the new Mission Impossible. I actually preferred this (The Trucker preferred Sherlock Holmes). It was pure escapism. I didn't really find it twisty & turny either, although I could tell they were going for that. Would kinda like to see the first one again now too tho. 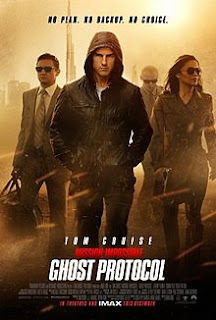 Curious to see if Tom Cruise has aged at all :P Haha. Yesterday, The Trucker had some work to do so I only saw him in the evening. But I had plenty of admin to get done. And just generally settle back in at home. I got the last 2 curtains I needed for the lounge (didn't want to buy them till I knew if I need 1 more or 2 more). Did a big grocery shop - The Trucker came over for dinner and I made delish gourmet burgers and berries with frozen yogurt. And then after relaxing over midday (it was too hot to do the gardening I had planned), I did get stuck into my garden. Mowed & trimmed the lawn (can't believe how fast it grows! ), cleaned the bunny hutch and went and got some new plants from Lifestyle and got them planted too. Also took out a whole lavendar bush. I was exhausted by the time The Trucker came over. So yeah, so far it's been a good year :P Sadly that has now been ruined by having to come into work again. At least the traffic was still quiet and there aren't that many people here yet, so it's a slow adjustment.